Polar bears are more yellow than white. That’s the somewhat peripheral thought that pops into my head as a bear suddenly crests a ridge 50 metres from where I’m sitting. I had been enjoying a game of chess and a cup of tea but now my heart is racing. At the moment, it doesn’t seem very important where I move my pawn. I scramble out of my seat and alert the others. My chess partner is Clifford Natakok, a hunting guide from the Nunavut community of Coral Harbour. With us is Evan Richardson, a polar bear research scientist with Environment and Climate Change Canada. Together, these two have spent more time around polar bears than I have around domestic dogs. Their cool reaction stands in stark contrast to my raised hackles. overhead, beluga and walrus splash in the bay, and caribou roam nearby. Mitivik Island is also home to Canada’s largest colony of common eider. Some 5,000 to 8,000 pairs of the sea duck nest here each year. For more than 20 years, the eiders on Mitivik (literally, ‘the duck place’) have been studied by government, academic and Inuit researchers. Long-term ecological studies of this kind are rare in the Arctic, but are more important than ever to understand our changing environment. documented from Alaska to Svalbard. 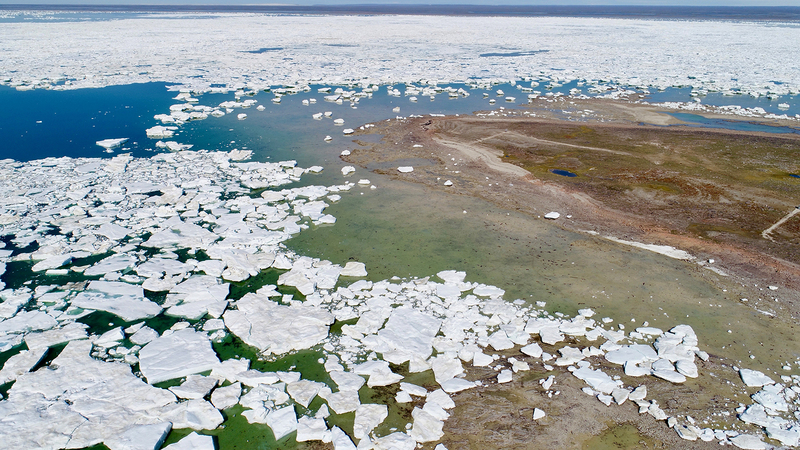 On Mitivik Island, the influx of polar bears has been so intense that the eider researchers have left, their studies cut short by the threat of marauding bears. The irony is not lost on me as I recover from my own bear scare. Six seasoned Arctic researchers thought the safety risks of working here were too great. But my team and I are determined to film polar bears trying to adapt to a warming climate. Over the next few days, bears show up in droves. At one point, we are sharing the tiny island — less than one-fifth the size of New York City’s Central Park — with four large carnivores. We have to keep our heads on a swivel. Even going to the bathroom is a complicated ordeal, requiring another team member to stand post as an armed guard to prevent an unpleasant surprise. But the bears I see on Mitivik Island are not the predators of my imagination. They plod slowly through the eider colony, grazing on eggs. When the mood strikes, they nap in the Arctic sun. During these lazy days, the speed, aggression, and power of these animals is hard to imagine. The bears' relaxed demeanour conceals the disruption that climate change is causing. The Arctic is warming faster than anywhere else on Earth, with increases between 2.8 and 7.8 C expected by the end of the century. Polar bears are considered globally at risk because of their dependence on sea ice, a habitat feature that is rapidly disappearing. The energy gained from hundreds of eider eggs is poor compensation for the time lost hunting on the sea ice. Northern people are also feeling the effects of climate change, perhaps moreso than anyone else. Warming temperatures are melting the permafrost that supports Arctic infrastructure. Melting sea ice makes hunting difficult and contributes to food insecurity. Rising sea levels threaten to submerge coastal communities. Arctic leaders have been sounding the alarm, calling for adaptation strategies and increased involvement of northerners in formulating climate policy. have all the time in the world to carefully scour the island. We watch the bears plunder the colony for eight days. Of the thousands of nests at Mitivik Island, it is now common to have more than 90 per cent lost to predation. At the end of this season, we find only a single eider nest intact, guarded by one clever duck who has laid her eggs right beside our cabin. How this new predator will affect the Mitivik colony in the long run is an open question. So far, the colony numbers have been stable. But if these ducks behave like their cousins in other study areas, they will find new nesting grounds to avoid the bears. 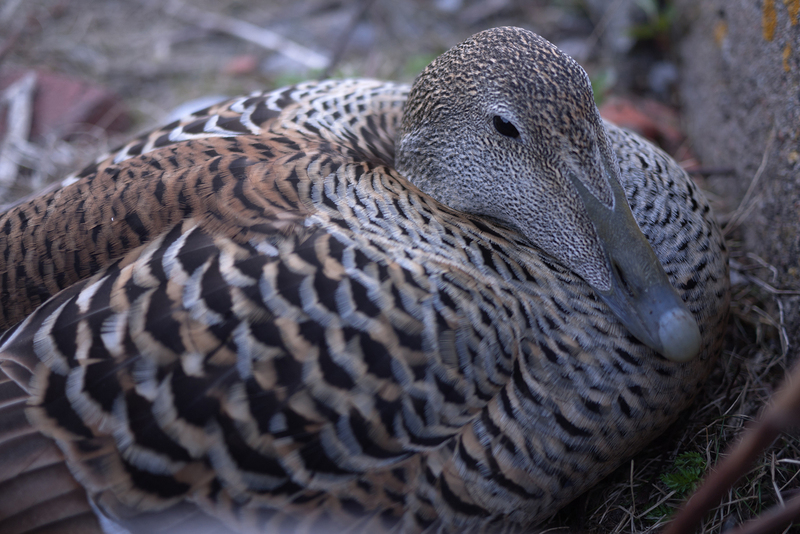 That climate change could cause the irreversible decline of eiders in ‘the duck place’ is a distinct possibility, concerning to researchers and locals. Ten days into our stay on Mitivik, there is no longer any sea ice surrounding the island. The colony is quiet. Most of the eiders moved on after their nests were destroyed. Without the attraction of eggs, the bears have left as well. As we pack up camp and wait for the helicopter my thoughts return to my interrupted chess game with Natakok — my pawns, and their predators on the board. Here on Mitivik Island, we see climate change in action. It is disrupting long-standing relationships between animals, people and the land. We don’t need to look 50 years in the future to see climate change. We only need to look north. Cody Dey is a Liber Ero Postdoctoral Fellow who researches climate change and Arctic wildlife. He is a member of the Process-Driven Ecology Lab at the University of Windsor. The Liber Ero Fellowship Program supports early-career scientists working to improve the conservation of Canada’s wild places and natural resources. Follow them on Twitter.